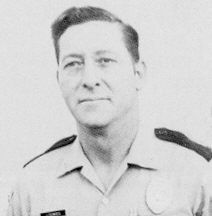 On Wednesday, January 18, 1978, Tenino Police Department Officer John Dowies was assisting another agency by locating a suspect wanted in an earlier disturbance. He knew the suspect and went to his house to talk with him. A struggle ensued, the suspect gained control of Officer Dowies’ service weapon and shot him. The 19 year-old suspect shot Officer Dowies in the side of the head, then straddled over top of him and shot him four more times in the head. The suspect was sentenced to 7 ½ years in the Walla Walla State Penitentiary. Officer Dowies is survived by his four children.